see you never forget me. 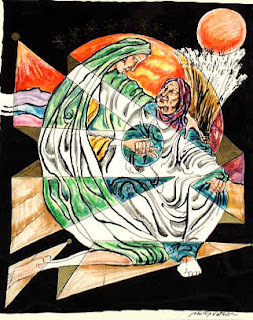 Artwork--Ruth and Naomi, Phillip Ratner, 1998. The Safad Bible, Israel Bible Museum. I was struck anew wth the invaluable gift friendships are in our lives. No doubt they are the relationships that prompt our positive actions like no other. I was particularly reminded that "every day we are given is an opportunity for God to carry us to where he eventually wants us to be." That's worth a memory committal.